Here is one of our favorite squirrels. It is a Gray Squirrel. 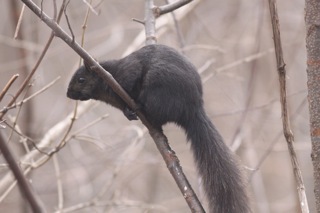 Small, local populations of gray squirrels have this gorgeous coffee color. This one lives in our neighborhood because a wildlife trapper released it here. 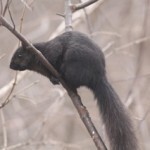 As a Gray Squirrel, it is noticeably slimmer than the local Fox Squirrels. And it spends more time up in the trees. It’s the only one that can leap to our platform feeder, too.